Flowers arranged in a vase can add elegance and style to any room. Streamlined fuss-free glass vases bring a touch of modern chic, while the rich glowing colours of terracotta pots work beautifully with anything from your humble daffodil to stunning orchids. At the end of the day it really is what you want, what your favourite flowers are and what colours you enjoy. But there are ways of turning those few flowers you’ve got in the garden, along with an odd bit of foliage, into something fantastic to look at. And it can take very little time to do. As a rule it’s generally best to avoid putting a patterned vase with a large colourful arrangement. It would look over the top and you would lose the beauty of the flowers. If you do want to use patterned containers, stick to simple displays of one colour, and let the flowers and the vase complement each other rather than fight against each other. Busy displays look best a plain coloured vase, while linear modern arrangements work well in tall glass vases or metal containers. Remember that an arrangement in a vase can be as expensive or as cheap as you want. Flowers and foliage from the garden are ideal or you can go to a florist who would recommend what goes together for a perfect display. For larger fuller designs chose virburnum, arbutus or tree ivy. Smaller designs work well with wax flower, soft ruscus or pittosporum while linear designs are always complemented with taller foliage such as tortured hazel, bear grass, willow or just some nice twigs from the garden. Single flowers such as chrysanthemum, roses, lilies or gerbera look good with most foliage or a bunch of daffodils look good on their own. 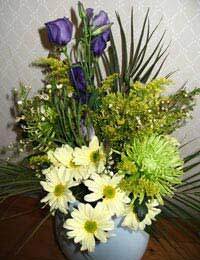 But if you are going to mix your flowers use a variety of shapes otherwise the arrangement can look bland. Once you’ve decided on what you are going to use you need to make sure it is good enough to use! Make sure your vase is clean, particularly if it has previously been used to hold flowers. Flowers left too long in water can give off bacteria and these can attach themselves to the inside of the vase where they will slowly grow. Condition your flowers beforehand. If they are from your own garden, cut them the night before and put them in a bucket of luke warm water filled up to about two inches below the flower head,. This will allow the water plenty of time to get to the flower heads. When you cut your stems, cut at an angle with a sharp clean knife. Florists’ scissors; narrow necked vase, three stems of chrysanthemums, three stems of lisianthus; solidago; wax flower; soft ruscus and three palm leaves;.binding wire; pot tape; flower food (available from florist). Lay out all your flowers and foliage and decide what shaped arrangement would look best with what you’ve got. Remove any leaves that would be below the water line and if you are using roses, remove any thorns. Fill your vase with water and flower food. Get the height and shape of your arrangement by placing a palm leaf at the back and either side. Add the lisianthus, graduating the stems by cutting them. On the opposite side to the lisianthus and starting slightly lower, graduate some stems of solidago. Place a large chrysanthemum bloom and several small chrysanthemum heads lower down. Fill in with ruscus and waxflower. Remember that when you put the stems in they should cross over below the water line to give anchorage. Sometimes when creating an all round design for a vase (generally a wide necked one) it can help to put strips of transparent tape across the opening. This will keep your stems upright and in position. Alternatively you could create a hand-tied arrangement and place it in a suitable vase. They are quick and easy to make and will hold their position without you having to do any further arranging.